When CHANEL says something like: ‘we’re going to bring back a discontinued flap bag’, we should response like: ‘Oh gosh, an opportunity to expand my collection’. You see, usually seasonal flap bags are cheaper than the classic flap bags, but the design are quite similar. They are quilted, CC logo is embellished, and the chains are often interwoven. And oh yes, a few days ago, we introduced the newest Chanel 3 Bag with extra pouch, you read that right? Or didn’t you? 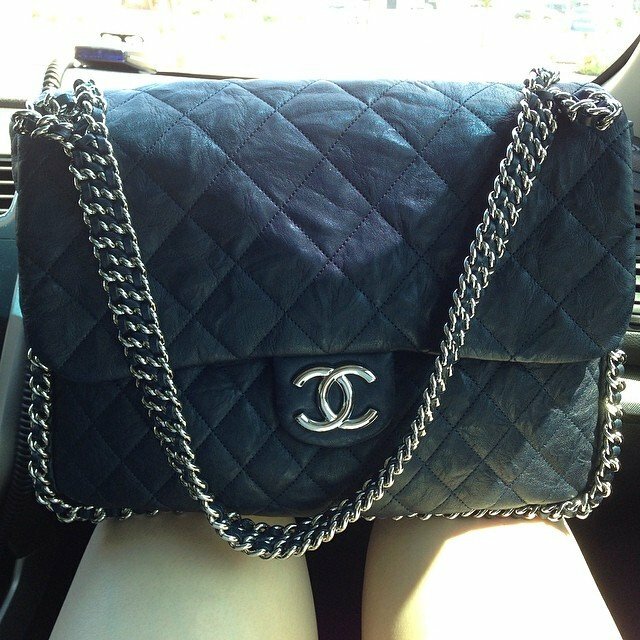 This post is to follow up on our previous review – the Chanel Chain Around Bag Collection. This line is not new, but released in 2010 and then discontinued. Now they are back and you have the chance to get one before they disappear again. And you know, because model pictures can be deceiving, we thought you might want to see some real snap shots of the Chanel Chain Around Bags. I mean, what’s a better picture than photo made with a phone, with no special effect or whatsoever. As you can see, the Chain Around Bag Collection consist of a flap bag and a messenger, both are to-die-for. An extra chain has been embellished around the bag, which is why it’s called ‘the chain around’. It’s a bag to distinguish yourself from the ‘classic flap bags’ owners. If you need to know more about the price and sizes, please click here: Chanel Chain Around Bag Collectionin Details.